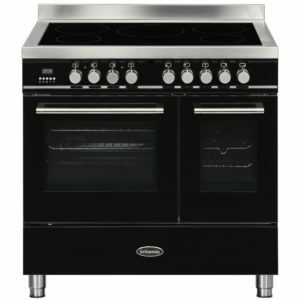 Packed with features, this attractive 100cm wide range style cooker from Britannia is ready to cook! Boasting two multifunction electric ovens and a six burner gas hob there are plenty of flexible cooking options. Not just incredibly functional, but a real talking point finished in stainless steel. The energy efficiency rating on this model is A/A and it comes with a two year parts and labour warranty as standard. 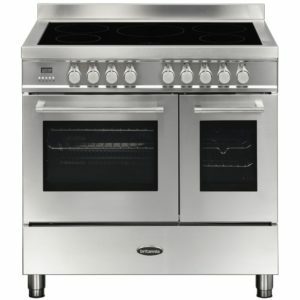 This fantastic Delphi range cooker from Britannia offers superb style with its clean lines and stainless steel finish. 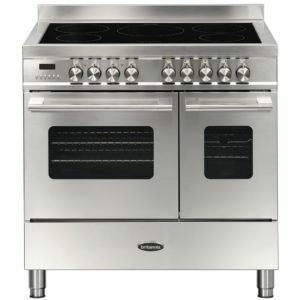 It is sure to turn heads for more than just its style however, as it is loaded with functions to make cooking a breeze. There are two spacious ovens offering a great selection of functions, so you can grill, bake, roast and a lot more, and when you're done there's a useful storage drawer for pots, pans or other cooking paraphernalia. Topped with a useful 5 zone induction hob, heat is only transferred to the pan as it is recognised, so you can be sure of efficient heat transfer and great control, with the added bonus of an easy maintenance surface. You will wonder what you ever did without this fantastic cooker! 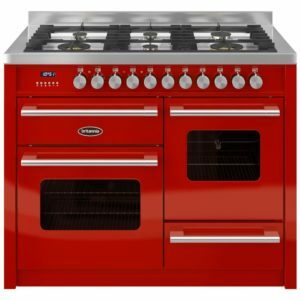 Finished in dynamic red, this attractive 110cm wide range style cooker from Britannia features two electric ovens with multiple functions and a six burner gas hob. You can make all the dishes you need. The energy efficiency rating on this model is A/A and it comes with a two year parts and labour warranty as standard. 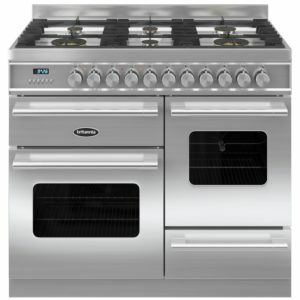 Built with Britannia build quality and with an eye on superior cooking, this 90cm wide range cooker stands out. 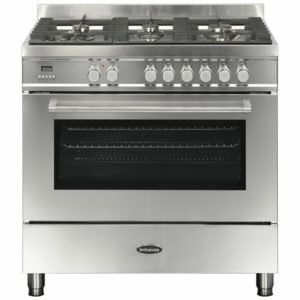 The generous single oven with 9 functions and the six gas burners make light work of the most complicated recipes. With a stainless steel finish it looks fantastic as well. The energy efficiency rating on this model is A and it comes with a two year parts and labour warranty as standard. Make cooking a pleasure and not a chore!This attractive 100cm Q-Line range cooker from Britannia is full of features, such as two electric ovens, a separate grill and a six burner gas hob. One of the ovens offers multiple cooking functions including true fan, conventional, fan grilling and more, the second oven is conventional with a grill. Wow! And it looks fantastic as well finished in stylish black. What more could you want? You will be able to create a feast with this fantastic 90cm wide range cooker from Britannia, thanks to its brilliant cooking options. Whether you're a novice to the kitchen or a regular baker, you will love the multifunction ovens, allowing you choice and space to fit in a great selection of food. There's a 5 zone induction hob top which, thanks to efficient heat transfer, gives you the fine control to cook perfect sauces or bring water to a rolling boil quickly. Finished in black, this Q Line model has modern lines and large porthole doors so you can easily see what is happening while you cook! Britannia's stunning 110cm wide Delphi XG range cooker features multifunction ovens, a six burner gas hob, a rotisserie and stay clean liners for easy maintainance. In modern stainless steel it will really make an impact in your kitchen. The energy efficiency rating on this model is A/A and it comes with a two year parts and labour warranty as standard. 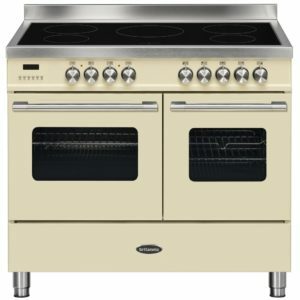 Attractively designed, with a gorgeous cream finish, this Delphi range cooker from Britannia is created so you can cook up some of your favourite recipes in style. With a five zone induction hob top, this 100cm wide range provides plenty of space for your pans. There are also 2 ovens, both offering a variety of functions, so you can pick the perfect option every time you cook. There's even a specialised rotisserie function for you to impress your guests with! 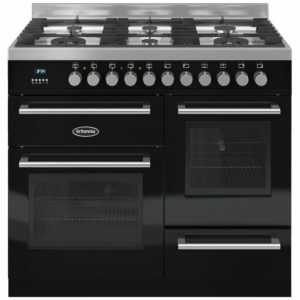 This stunning 90cm wide range style cooker from Britannia features multifunction electric ovens, a rotisserie and a six burner gas hob. Ready to go with easy clean liners, you don't have to worry about tough mess to clean up after cooking your favourite foods. Looking good in cream it is a real conversation piece. The energy efficiency rating on this model is A/A and it comes with a two year parts and labour warranty as standard. This superb 100cm wide Q-Line cooker from Britannia will help you create a fantastic selection of meals thanks to all the features it is full of! There are 6 gas burners on the hob top, offering fine control of the heat, meaning you can easily get water to a rolling boil or gently melt chocolate. There's a 9 function left hand oven and 4 function right hand oven, both providing a great selection of functions, and even more specialised choices like the rotisserie, so you will certainly be able to impress your friends with your culinary skills! 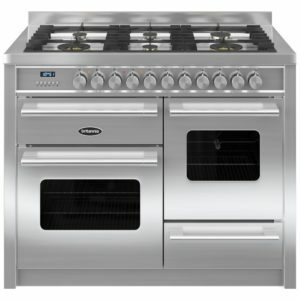 Finished in stainless steel, this range cooker is sure to add a superb focal point to a modern and busy kitchen. This superb Q Line induction cooker from Britannia will add style and easy cooking to your kitchen. Finished in stainless steel, with smooth lines and large glass windows, it certainly will turn heads! Thanks to two ovens, you can fit in even the largest family roast dinner, and as there are a variety of cooking functions to choose from, you can pick the perfect option for every meal. Topped with a 5 zone induction hob, there's space for all your pans, and as heat is only transferred to the pan as it is detected, you get great control and efficiency! 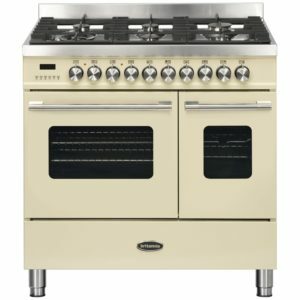 This superb range cooker from Britannia is perfect for every level of chef, whether you are a novice cook or a regular baker. With two ovens offering choice and flexibility, you can cook several items at once and using different functions. So even a pizza in one oven and rotisserie chicken in the other is an option! With the main oven containing Stay Clean liners and telescopic runners, it's incredibly easy to use and maintain, and thanks to the handy storage drawer, you can keep some essential items close to hand. The 5 zone induction hob top provides efficient heat transfer, as electromagnets only pass heat to the pan as it is recognised by the hob, so there's much less heat loss and great control. 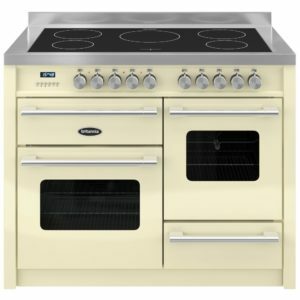 Finished in cream, with Britannia's stylish Delphi design, this cooker will make a great talking point in your kitchen!